Tim Connolly on waivers. I've always had a soft spot for him, he was so slick in Buffalo until he became undisputed bandaid boy champion. If his contract wasn't so hefty, I wouldn't mind if the Nucks picked him up to shore up the center position. Waivers acquisition requires the team that used to own him to pick up half the salary right? Just bought 3 Jerseys apparently you can buy it now and get it price adjusted afterwards on Saturday! dont really get why everyone so bullish on the blues, people picking them to top the west, get to the cup, etc. speaking of shawn79, what happens if we trade luongo for lupul + 4th rounder? There's a really good chance that the red wings won't even make the playoffs this year. The Blues are going to do damage no questions asked and I'm still worried about the Pulers since their two top lines have played half a season already and will be in game shape. 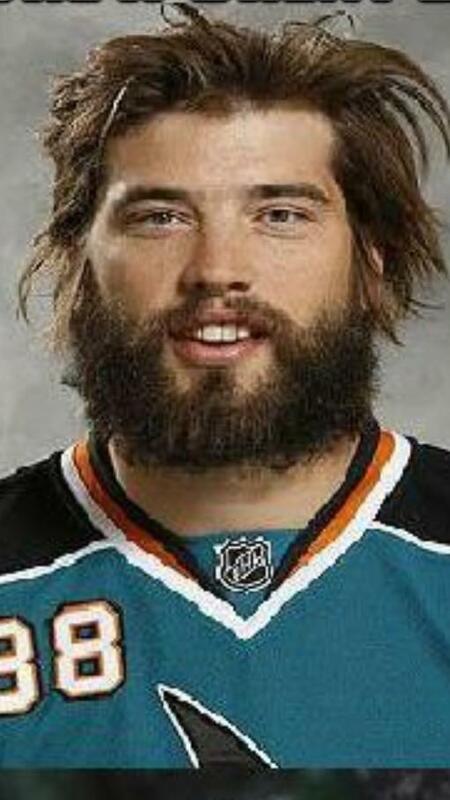 SAN JOSE -- Sharks defenseman Brent Burns spent much of the offseason recovering from hernia surgery. Apparently that prevented him from shaving or combing his hair. Burns' team photo for the Sharks, with his unkempt hair and a beard that appeared to not have been trimmed or shaven in at least a month, made a splash on the internet and Twitter on Thursday after it was posted on Yahoo! 's Puck Daddy hockey blog. Some of Burns' teammates were shown his most recent team picture, and mostly shrugged their shoulders. "I've seen him grow it, but not keep it so long," said defenseman Dan Boyle, whose locker is next to Burns' inside the dressing room at the Sharks practice facility. "Maybe it was a lockout beard. I don't know what he's got going on there." Burns has not been at the facility in recent days and Sharks coach Todd McLellan did not have an update on Burns' injury, other than saying Burns has been continuing to receive treatment for the injury. Jerseys are $220 and then 50% off? Thats cheap are those the Auth ones tho? I pay $350 for my Auth ones. the ones they are selling at the authentic "replicas"
Last edited by Not really racist! ; 01-17-2013 at 10:13 PM. Gives cabbie $20, "Have yourself a mouthwash!" originally it was only on re-entry waivers where the salary was split but the new CBA no longer has re-entry waivers according to wikipedia. i was there on wednesday and i am fairly certain i saw the authentics. wish i had known that i can get it then and then have a price adjustment. i guess i will go early tomorrow to see if i can get one.